My prediction: hybrid storage is dying. The cost delta between disk and flash is rapidly diminishing. The cost curve on enterprise-grade flash is much steeper than disk, with prices set to decline at 40% per year for flash, versus 13% for disk. The value that hybrid storage vendors are capturing today will decline, and so will their market segments. 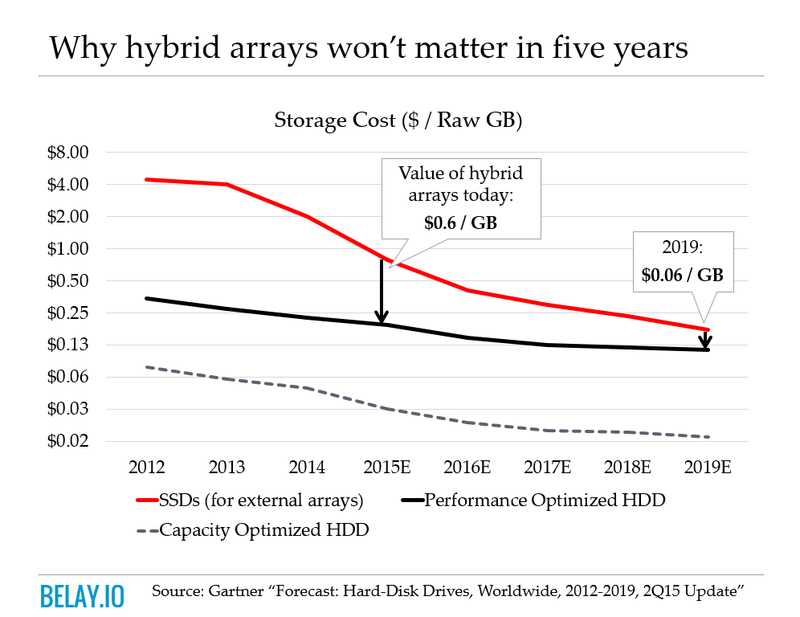 In 3-5 years, I don’t think anyone is going to be buying new disk (hybrid or otherwise) for high performance workloads; and I think 10K drives will be entirely absent from datacenter within 10 years. The cost curve on electrical performance (NAND) is much steeper than mechanical performance (disk). You’ll still have scale-out disk.